Description: Designed with a curved profile and a clean architectural look, this appealing and versatile ceiling fixture defines a sophisticated aesthetic. 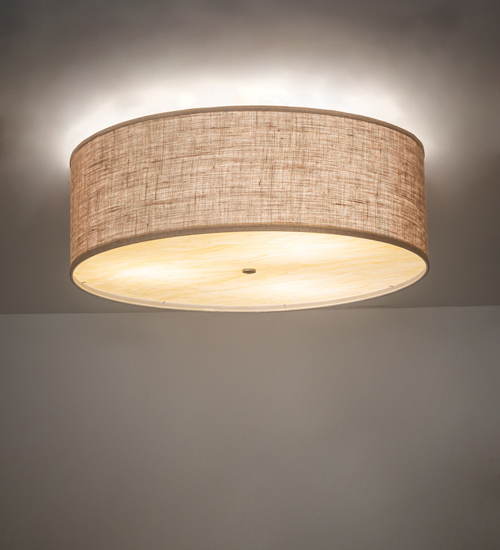 This fixture features a distinctive Honey Bombay Textrene shade, which is enhanced with a Bottocino Idalight bottom diffuser. The hardware is featured in a Nickel powdercoat finish. This flushmount is illuminated with customer-supplied compact fluorescent lamps. Handcrafted by highly skilled artisans in our manufacturing facility in Upstate New York, this transitional styled fixture is available in a wide range of custom choices including various designs, colors, sizes and dimmable energy efficient lamping options such as LED. This fixture is UL and cUL listed for damp and dry locations.